Kevin Fox is writing on the Svbtle network. A last-minute prediction for the iPhone 7. As usual, the hardware specs for the upcoming iPhones have been well leaked while the software surprises are subject to a lot more speculation. The iPhone Plus has dual cameras, but to what end? Super-resolution? Hardware-supported zoom? Synthetic aperture control (‘bokeh on demand’)? The event invitation would seem to allude to the latter, though the three aren’t necessarily mutually exclusive. But I’m here to talk about the bigger elephant in the room: Headphones. Sure, Apple has a reputation for removing ports and drives from their devices before the public thinks it’s time to, but the 3.5mm headphone jack’s lineage and pervasiveness far exceed either the floppy drive or the optical drive, and people are having a hard time swallowing this pill. But within a few years this will be seen as a natural and obvious move. Update: Based on feedback from readers, it looks like this may still be the earliest Apple home page, but is more likely from 1993 or early 1994. But that was 1997. 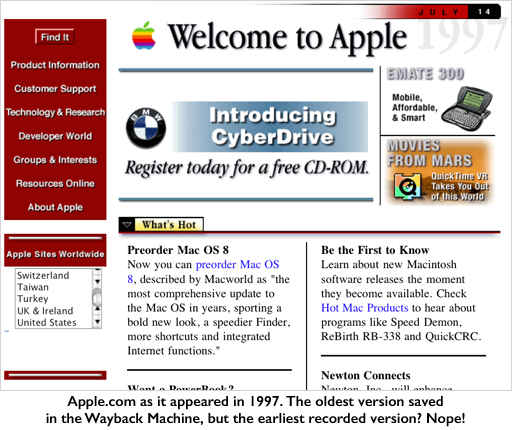 What did Apple.com look like at the very birth of the World-Wide Web? Say around 1992? September is my favorite time of year. It’s my wedding anniversary, Summer gives way to Fall, and Apple releases its magic. As much hype as usually precedes an Apple Event, this year is special. This may quite simply be the most-hyped Apple Event since the announcement of the iPhone in January 2007, and just as notable is the fact that the excitement isn’t exclusively around a single product. iPhone 6, iWatch, iOS 8, HealthKit, HomeKit, the promise of an iPhone payment platform, and perennial hopes about the evolution of the AppleTV. Rumors have been bouncing around the echo chamber ranging from well-sourced leaks to wistful speculation, and the only certainty is that much will be revealed Tuesday in what will likely be the most-watched company presentation of the decade so far. Last week my mom sent me an email including scans from the folder my dad kept of various memorabilia from my life. Among them was the statement of purpose I wrote when applying to grad school back in 2001. I’ve often thought about that document but, even though I’m an assiduous information pack-rat, this piece of writing apparently slipped through the digital cracks. And so I was so happy to find that when I sent it to him for feedback so many years ago, my father had kept a hardcopy. I clearly remember how hard it was to write this. What document could be more all-encompassing, more defining than a statement of purpose. Who are you? Why are you here? What do you hope to achieve? I struggled with the document for weeks leading up to my application deadline. I wrote several completely different attempts but never seemed to rise above the trite or cloying. It’s been a while since I’ve blogged. Lately I’ve been focusing more on observing more than expounding, breathing in more than breathing out. It’s all a cycle. My uncle Alan has a similar cycle, though offset from my own. An entrepreneur before it was cool, Alan’s been running a very successful real estate company for decades. In an industry that is all about people, he’s thrived by understanding what people really want (despite what they say or even think) and using these tools to build a booming business and organization. After decades of sharing fragments of these tools with his investors, tucked inside the company’s quarterly updates, Alan has compiled, written, refined, edited, added, edited again, and finished a book of 54 of these ‘People Tools’ and today, with a huge exhalation, it’s available at Amazon. As one of the dozens of talented people who made Google Reader a reality over the years, I would like to extend my gratitude to you, the millions of users who made it part of your routine and your lives. Looking on the bright side, closing down a site with an active user base gives us all the opportunity to celebrate the product’s 7.5 year run in a much richer way than the far more common ‘last one here please turn off the lights’ kind of demise. In the last three months there has been a renaissance of activity in the RSS/newsreader world. Products that had long been idling renewed development, products that relied on Google Reader for their back-end have successfully shifted to their own infrastructure, and major Web players rushed to create their own readers to fill the imminent gap. It’s been over seven years since I did any design work on Google Calendar, and there are always parts that I wish I’d gotten to before I moved off the project. Rough edges get smoothed with time, and products get more refined and it’s best not to hold on too tight. That’s all, really. Consider it a lollipop to distract me from the imminent destruction of Google Reader. We need to spin this ASAP, and make two of the most respected news outlets in the world look like sensationalist supermarket rags. Rather than speculate on whether Apple is making a watch, when they might unveil such a product, and how much it would sell for, I’m going to take a few minutes to talk about how such a device would fit into the ecosystem of products and why you’ll want one. It wasn’t so long ago that most people wore watches and used them to tell time. Long after the majority of adults carried early-generation cellphones or pagers that kept more accurate time than fobs on wrists, we still wore them because digging out (or unholstering) a phone just to check the time was a chore. As phones shrank into our pockets this slowly changed, but it wasn’t until we started seeing cellphones and pagers as small multi-function devices that we started leaving our watches on the nightstand. By 2008, nearly two-thirds of teens never wore watches, and only one in ten wore a watch daily. This week the University of California unveiled a striking new logo and brand for their network of campuses, and it hasn’t gone un-noticed. Following the trend of emotions and bright colors over words and nuance, several of the nation’s most prestigious centers of higher education scrambled to cement their own continued relevance in this new era. Steeped in tradition but wanting to keep its image fresh and accessible to future generations, Harvard sought a logo that represented its historical role of bridging the gap between the upper-middle class and the ultra-wealthy. The red square is representative of Harvard Square.